Regal elephants parade through a field of flowers celebrating Thailand's unique artistry. In red and gold over black, the cotton brocade adorns an elegant shoulder bag designed by Thikaporn. 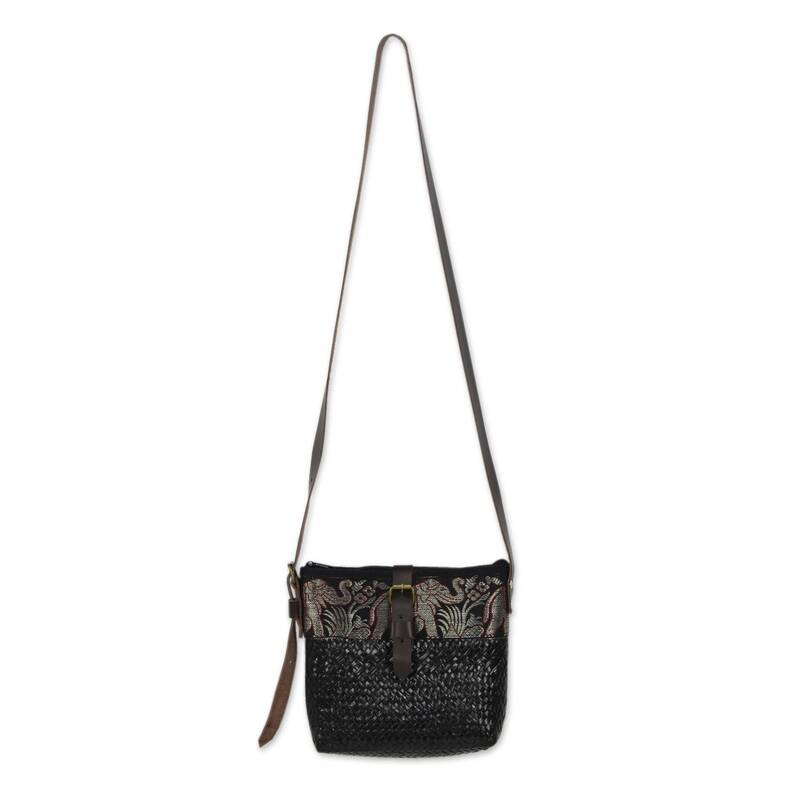 The bag is woven of sedge dyed black, and is worn on an adjustable brown leather shoulder strap with brass fixtures. The decorative buckle covers a magnetic button and the bag closes with a zipper. Lined in black cotton, the bag has an open pocket. Artfully crafted by Thikaporn from Thailand. "I am very happy to show what my people, the Akha people, can do to the people around the world. 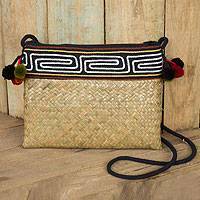 The weaves are combined with Lanna art as well as with Akha sewing and crafts." "I am an Akha, and my people tend to live in small villages at high elevations in the mountains of Thailand, Burma, Laos, and in the Yunnan province of China. I was born in a hill tribe village in Maetang, and soon after my family moved to the city, where my father came to work. Back then, it is deemed that he was the very first generation who came down to the city for merchandise trading. My father didn't have an education and could hardly speak Thai, but through hard work and perseverance he learned so that he could communicate with Thai people and foreigners, and ultimately run his own shop. I used to rush to help him after school every day. "First he opened the shop at the Night Bazaar in the heart of Chiang Mai and after five years he moved to the Chatuchak Market in Bangkok. This is the largest weekend market in Thailand receiving 200,000 visitors each day. 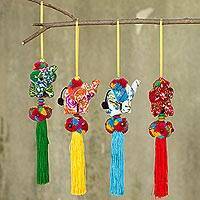 Father would purchase hand-woven bamboo products from hill tribe artisans and then dye them to obtain new colors for home décor purposes. 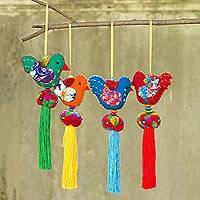 The products included the needlework that made by my mother and neighbors. "He had to craft the products in Chiang Mai from Monday to Thursday, and then he would travel to Bangkok on Friday, Saturday and Sunday. He did this, including the 10 hour drive from Chiang Mai to Bangkok for over 25 years. I was studying in college and needed to take trainee course for one year, so in 2009 he closed up shop as he was getting older. Also, my brother was too young to help, so father only crafted products as per customer orders. 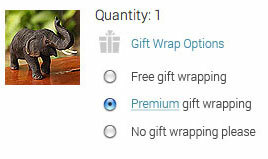 I took the responsibility to coordinate with our customers. "After I graduated I worked as a spa manager for four years. I continued to help my family as usual. However, the products were still the same. I started to think about running my own business, and expanding the family business. "So, I quit my job in order to run our family venture full time. Our main products used to be made of bamboo that had been hand-woven by the elder people from the hill tribes, but as they got on in age their capacity to weave has decreased to the point they can't do it anymore. On the other hand, the younger generations are relocating to work in the city, so we couldn't find enough artisans to work with. "I found out about products made of bulrush, which is an annual crop and easy to find, available in many parts of southern Thailand. Bulrush is similar to bamboo, but more durable and stronger. 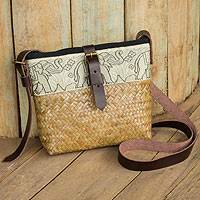 So I decided to work with plain hand-woven bulrush handbags, which we then embellish by lining them and decorate them with Lanna patterned fabrics. 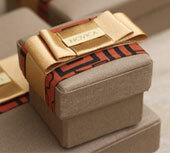 We also combine them with the creative embroidery unique to the Akha people, who are skillful at needlework. "It is very important to improve the quality of life of the Akha people who live in the city, as well as those who live in the mountains, and develop products so we may have a better future. "Akha people earned very little wages from their routine work because their education level is not high, and some have no education at all. So, the income was insufficient. Therefore, I volunteered to try to get more orders for my products so I could help my family, my relatives and the other Akha people who live in Chiang Mai. 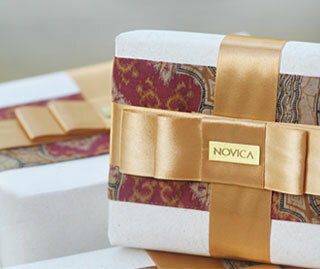 So I thought it would be a good idea to present our work to Novica. "I am very happy to show what my people, the Akha people, can do to the people around the world. 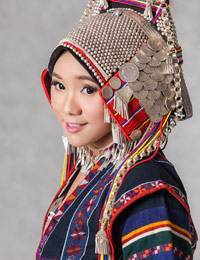 The weaves are combined with Lanna art as well as with Akha sewing and crafts. I would like to thank all of you who help support our products. 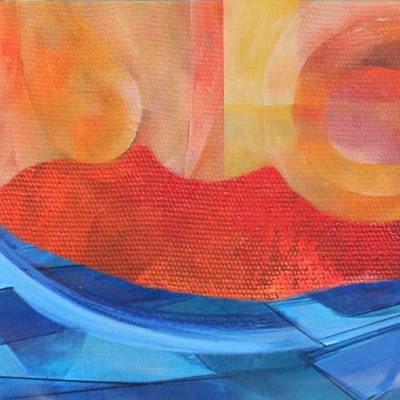 Every purchase encourages us to develop our work and preserve our creativity."